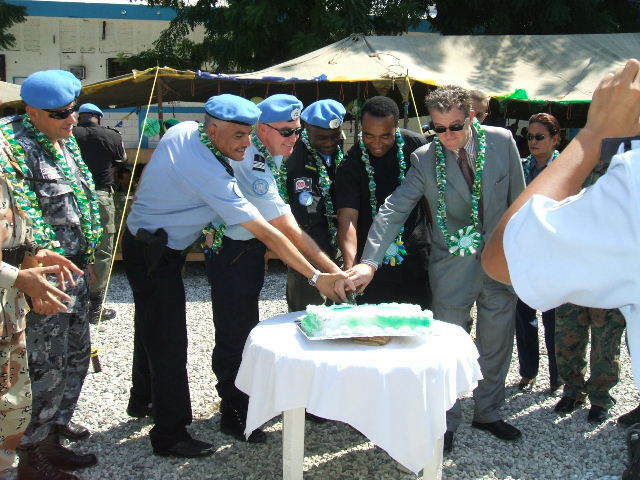 There have been UN troops stationed here in Haiti since President Aristid was forced to leave the country Feb. 29, 2004. We often see them on road, at check points and patrolling Port-au-Prince. We always smile, wave and greet them. We’ve seen them from places like Brazil, Jordan, Sri Lanka, Senegal, Uruguay, France, and Canada. Not long ago, Felix actually saw some Nigerians standing guard at one of the cross roads near DHQ. When he approached them, they were naturally a bit suspicious until he greeted them in English. From that contact, they invited him to come see them at their camp. What a surprise to find out that the man second-in-charge is Dr. Emmanuel Eze, from a village not far from his. 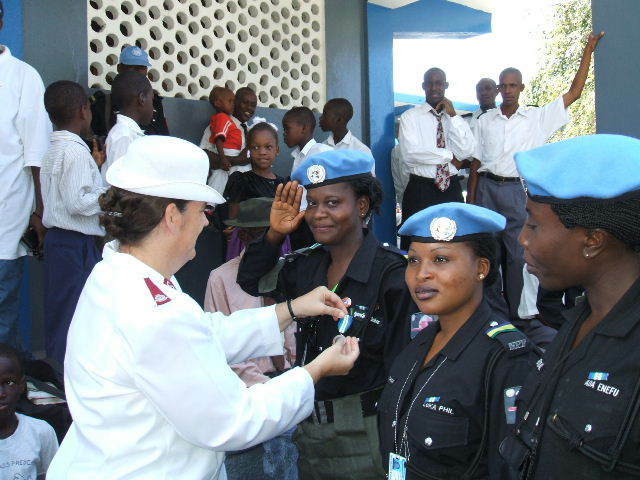 Dr. Eze invited us to be part of the UN medal ceremony and even requested that I be among the women designated to pin the medals on the female soldiers! It was a day full of pomp and military fanfare. The heads of the other nations’ Formed Police Units (FPU) were there, supported by their staff. They included representatives from France, Canada, China, Nepal, Jordan, Argentina, Senegal, Bokina Faso, and Sri Lanka. The Nigerian FPU Advance Drill presented a regimented drill and there were cultural dances. It was quite thrilling. How awesome! Praying for you! Blessings! What a tremendous honor. Such beautiful people! 24 people in our session. Mwen te kompran preske tout bagay. Kek tan mwen bezwen pale chak mo ou ekri paske ou ekri li difran pase mwen te aprann. Le mwen tande’l mwen kompran.